Rosetta Stone does a swell job at helping you become familiar with every day topics and vocabulary. It follows a trademark concept called Dynamic Immersion, which removes translation and grammar explanation from the learning process. Just as you learned your first language, you begin learning a new language by association. 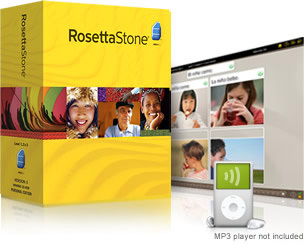 Rosetta Stone offers many resources that aid in the hearing portion of language-learning. Rosetta Stone allows one to hear native speakers, and this helps one learn how to better pronounce the language. If you are already familiar with the grammar of a language, Rosetta Stone can help you to review what you already know. In the long run, the lack of grammar and vocabulary instruction is not conducive. Sure, you might not have to learn the tedious rules now, but you will eventually – and at that point, you will just be fumbling around in the dark. This means you will have to figure it out by “trial and error” – lots of errors. It all comes down to practice. If you don’t know it, then you cannot practice. Rosetta Stone can give you a false sense of confidence when it comes to utilizing a language. Instead of using creative and logical thinking, it merely has you repeat sentences that work in context. Therefore, in a “live” conversation, you may not feel prepared to organically converse. As with any subject of learning, online programs are not as effective as face-to-face learning with a professional. Having someone there to listen and critique on the spot is invaluable, and will help you prepare for real life interaction. Rosetta Stone might be better utilized as an aid to in-class learning.